Castle Crashers is a game that provided many fond memories back in the day. This is a game that I had spent countless hours with a couple of my friends trying to find every hidden item, leveling up our knights, or simply trying to see if we could improve how quickly we could clear a stage. As a result, I had high expectations when I started up Castle Crashers Remastered, hoping that it would live up to my memories. Thankfully, it did. The first thing that we will want to get out of the way is that the differences in the presentation between this game and the original is that the graphics haven’t really changed all that much, so you will want to look elsewhere if you are looking for a massive improvement. Instead, this game offers smoother action, more vibrant colors, and a bit sharper visuals. This game sticks to 60fps and 1080p throughout the entire experience. I find that this is actually a good thing as the visuals were always a perfect pairing with the silly setting. For those of you who haven’t played the original game and are unfamiliar with the art style, it is basically a very cartoony fantasy world where you can expect to see headbanging knights and woodland creatures defecating in fear at the approach of boss creatures. You can also expect to see giant cats attacking and sharks rampaging through rivers. In other words, don’t take the game too seriously and just enjoy the ride. The music in this game is also a nice touch as the various tracks throughout the game make you feel very engaged and entertained. It is hard not to smile when a rock track starts playing while you are busy decapitating or tearing into the enemies. Despite being a side-scrolling game, Castle Crashers Remastered does not follow the platforming aspect that most side-scrollers adopt. Rather, your whole goal in these game is to simply kill everything in sight, collect the treasure, and do it all over again for the entire course of the game. The combat in this game is quite basic with simple combos becoming unlocked as you level up. This is actually a good thing as well since the simplicity of the combos and controls make the game accessible for players of all skill levels, which is important because you will definitely want to be able to play this with as many friends as you can. While the game can be played on your own, it is much more manageable (and entertaining) to play it with the full roster of four players. This will not only make it less likely that you will be overwhelmed by hordes of enemies, but also provide a lot of memorable moments as you and your friends either panic over impending death, or race to get more treasure than your teammates. Getting friends together to play this game is not all that difficult as you can simply go for a bout of couch co-op if you have enough controllers on hand. If your friends live a fair distance away, or if everyone just wants to hop in for a quick session, you can also play online. It is hard not to recommend this game based on the sheer amount of value that it provides. Not only will this game provide hours of fun for you and your friends when playing through the main campaign, there are tons of extras to unlock as well. You can track down all of the animal minions, collect a truly massive number of weapons, and unlock new characters. In addition, each of the knights will level up independently, so a lot of time can be invested in exploring the magic and abilities of each individual knight. While the price may seem high to some people at $14.99 for a remastered game that is pretty simplistic, the price tag is actually justified due to all of the content. To make the value even better, if you already own the game on the 360, you can get Castle Crashers Remastered for free until September 20th. 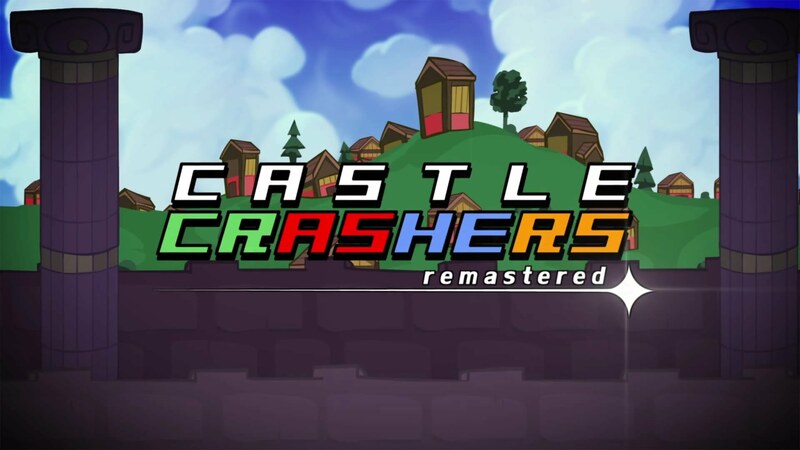 With loads of content and a charming art style, Castle Crashers Remastered is a unique beat-em-up that will provide many hours of enjoyment for fans of the original and new players alike. Want to share any fond experiences with the Castle Crashers games? Agree or disagree with the review? Comment below and let us know!